Sean Connolly is the Commissioner of the Connecticut Department of Veterans' Affairs. He's also a Lieutenant Colonel in the U.S. Army Reserve. 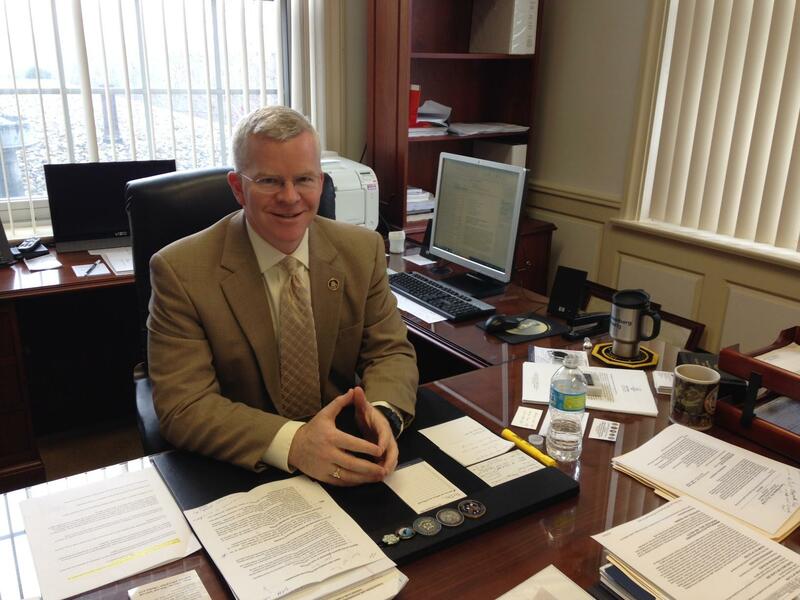 Sean Connolly is the new Commissioner of the Connecticut Department of Veterans Affairs. He's also a Lieutenant Colonel in the Army Reserve who says he wants the state to do even more to serve all veterans. Connolly served in Operation Iraqi Freedom as a Prosecutor and Brigade Legal Advisor with the 101st Airborne Division at Fort Campbell, Kentucky. He was the first in his family to join the U.S. military. Connolly said his father, an Irish immigrant, influenced him. "I think it was probably every day he would describe how great America was -- how it's the greatest country in the world, and how the opportunities here are just amazing. So that got ingrained in me," he said. Connolly served more than seven years on Active Duty before working in the private sector in D.C., and then in East Hartford, his hometown. He was the Global Ethics and Compliance Officer for jet engine maker Pratt and Whitney. But he missed public service, and is excited for his new role with the state Department of Veterans Affairs. Inside Commissioner Connolly's office are the many military challenge coins he's received during his career with the U.S. Army. Connolly said there's room for improvement, from re-thinking how to use the sprawling Rocky Hill campus, to changing up the services it provides. "We have 200,000-plus veterans around the state," he said. "I want any one of them to feel comfortable that they could come here. So is there something we can provide? Maybe it's a Veterans Center of Excellence that anyone can walk into, and we can direct them in some way." Many of the buildings on the grounds of the state VA are more than 70 years old, including a domiciliary for veterans who, once at risk for homelessness, now live. But Connolly said the campus could do more to attract veterans from other generations, including the younger men and women who served in Afghanistan and Iraq. "I'm one of the OIF veterans," Connolly said. "This generation is not as apt to join veteran service organizations I don't think, although I do see some. It's partnering with the VSOs to try and be inviting as possible to the younger veterans." One way Connolly hopes to connect with younger veterans is through social media. And he plans on continuing to travel around Connecticut, home to more than 270,000 veterans. Dr. Linda Schwartz was a long-time Commissioner of Connecticut's Department of Veterans Affairs. Six months ago, she left to begin a new career at the U.S. Department of Veterans Affairs after being confirmed last fall as Assistant Secretary for the VA's Office of Policy and Planning.